Rebuild the cube, using the Rebuild option in the Architect, for example. This process can be time-consuming, and queries cannot be executed while a cube is being rebuilt. Synchronize the cube. 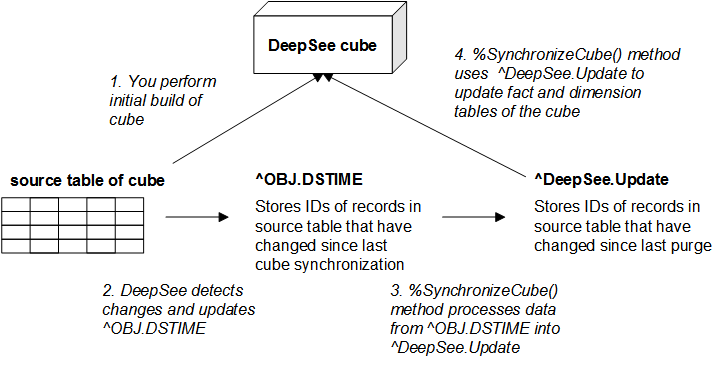 The cube synchronization feature (also known as the DSTIME feature) enables DeepSee to keep track of changes to the data. You periodically synchronize the cube to include those changes. It is possible to execute queries during synchronization. Depending on the cube implementation and depending on which data changes, it may not be possible to use this feature; see When Cube Synchronization Is Possible, later in this chapter. Update the cube manually. This process uses the %ProcessFact() and %DeleteFact() methods. Unlike with the other options, in this case, it is necessary for your code to know which records of the fact table to update or delete. It is possible to execute queries during the manual updates. For information on the Cube Manager, see Using the Cube Manager, later in this chapter. For any kind of update, whenever you have cube-to-cube relationships, it is necessary to update the cubes in a specific order. In particular, update the independent cube first. Then update any cubes that depend on it. To do this, you can use the Cube Manager, which traverses the relationships and determines the correct update order. Or you can write and use a utility method or routine that builds your DeepSee cubes in the appropriate order. For any cube that uses more than 512,000 records (by default), DeepSee maintains and uses a result cache. For any combination of update techniques and tools, you should also carefully consider the frequency of cube updates, because any update could invalidate parts of the result cache. For large data sets, DeepSee maintains and uses a result cache for each cube as follows: Each time a user executes a query (via the Analyzer for example), DeepSee caches the results for that query. The next time any user runs that query, DeepSee checks to see if the cache is still valid. If so, DeepSee then uses the cached values. Otherwise, DeepSee re-executes the query, uses the new values, and caches the new values. The net effect is that performance improves over time as more users run more queries. When you update a cube in any way, parts of the result cache are considered invalid and are cleared. The details depend upon options in the cube definition (see Cache Buckets and Fact Order, earlier in this book). Therefore, it is not generally desirable to update constantly. This section describes briefly how cube synchronization works. Internally, this feature uses two globals: ^OBJ.DSTIME and ^DeepSee.Update. First, it is necessary to perform an initial build of the cube. When Caché detects a change within the source table used by a cube, it adds entries to the ^OBJ.DSTIME global. These entries are to indicate which IDs have been added, changed, or deleted. Then Caché uses the ^DeepSee.Update global and updates the fact and dimension tables of the cube, thus bringing the cube up to date. The base class for the cube is a persistent class (but is not a linked table). The changed record is a record in that class. The changed record is not in the extent of the base class used by the cube. That is, the changed record belongs to another table. Also, cube synchronization does not affect age dimensions (that is, dimensions whose Dimension type is age). If you use DeepSee on a mirror server, note that the ^OBJ.DSTIME global is part of the application data and should be mirrored (if it mapped to a different database, for example, that database should be mirrored). The ^DeepSee.Update global is generated by DeepSee code and thus is present only in the database that contains the cube definitions and data. On the mirror server, the databases that store the ^OBJ.DSTIME and ^DeepSee.Update globals must be read/write. Note that you can store both of these globals in the same database, although the above figure shows them in separate databases. For a discussion of using DeepSee on a mirror server, see Recommended Architecture in the first chapter of this book. This section describes the structure of the cube synchronization globals. You do not need this information to use cube synchronization; this information is provided in case you wish to use these globals for other purposes. The ^OBJ.DSTIME global has a different form depending on whether DSINTERVAL is set. Note that it is possible to manually delete a fact from a fact table without deleting the corresponding record from the source class by using the %SetDSTimeIndex() method. DeepSee removes unneeded entries from the ^OBJ.DSTIME global when you synchronize or rebuild a cube. ^DeepSee.Update("cubes",cube,"dstime") where cube is the logical name of a cube Integer that indicates the next value of increment to use when creating nodes in this global to record changes for the given cube. ^DeepSee.Update("cubes",cube,"lastDataUpdate") where cube is the logical name of a cube The date and time (in $H format) when this cube was last synchronized. The nodes under ^DeepSee.Update("DeepSee.Study.Patient",0) represent the first set of changes, the nodes under ^DeepSee.Update("DeepSee.Study.Patient",1 represent the second set of changes, and so on. Make sure that cube synchronization is possible in your scenario. See When Cube Synchronization Is Possible, earlier in this chapter. The parameter value is not case-sensitive. This parameter primarily affects how entries are stored in the ^OBJ.DSTIME global; see Structure of the Cube Synchronization Globals. The form of the ^OBJ.DSTIME global has no effect on the behavior of the cube synchronization mechanism. Recompile the base class and all cube classes that use it. This section describes how to clear the ^OBJ.DSTIME global. In some cases, you might want to periodically clear the ^OBJ.DSTIME global. For example, if you are not using cubes in DeepSee, you may want to clear the ^OBJ.DSTIME global to free up space. This task clears ^OBJ.DSTIME entries if they aren’t being used by DeepSee cubes. Use the Task Schedule Wizard to schedule the task to run as often as necessary. The Cube Manager tasks are visible in the Task Manager, which is discussed in Using the Task Manager in the Caché System Administration Guide. InterSystems recommends that you do not modify these tasks in any way. The Cube Manager enables you to define the cube registry, which contains information about the cubes in the current namespace. In particular, it contains information about how they are to be built, synchronized, or both. The cube registry defines a set of cube groups. A cube group is a collection of cubes that need to be updated together, either because they are related or because you have chosen to update them together. When you first access the Cube Manager, it displays an initial set of cube groups. Each initial cube group is either a single cube or a set of cubes that are related to each other (and thus must be updated as a group). You can merge these initial cube groups together as wanted. You cannot, however, break up any of the initial cube groups. Each cube group is initially unregistered, which means that it is not included in the cube registry. After you register a cube group (thus placing it into the registry), you define an update plan for it. The Cube Manager creates automatic tasks that use these update plans. See the next section for details. Build and Synch  Rebuild periodically, once a week by default. Also synchronize periodically, once a day by default. This option is not supported for a given cube unless that cube supports synchronization (as described earlier in this chapter). Build Only  Rebuild periodically, once a week by default. Synch Only  Synchronize the cubes periodically, once a day by default. Before you synchronize cubes from the Cube Manager, it is necessary to build the cubes at least once from the Cube Manager. Manual  Do not rebuild or synchronize from the Cube Manager. Instead, use any suitable combination of other tools: the Build option in the Architect and the %BuildCube(), %SynchronizeCube(), %ProcessFact(), and %DeleteFact() methods. For details on the latter three methods, see later sections of this chapter. For each plan (other than Manual), you can customize the schedule details. For any namespace, the Cube Manager defines two tasks: one performs all requested cube build activity in this namespace, and one performs all requested cube synchronization activity in this namespace. Both of these tasks follow the instructions provided in the cube registry. Both tasks also automatically process cubes in the correct order required by any relationships. The Cube Manager provides an Exclude check box for each registered group and cube, which you can use to exclude that group or cube from any activity by the Cube Manager. Specifically, the Cube Manager tasks ignore any excluded groups and cubes. Initially these check boxes are selected, because it is generally best to not to perform updates until you are ready to do so. For example, you might want to adjust the DeepSee agent counts before building any cubes. Click DeepSee > Admin > Cube Management > Registry. Cube Registry Class Name  Specify a complete class name, including package. This class definition will be the cube registry for this namespace. Update Groups  Specify how to update groups with respect to each other. If you select Serially, the tasks update one group at a time. If you select In Parallel, the tasks update the groups in parallel. Allow build to start after this time  Specify the earliest possible build time. You can change all these details later, apart from the class name. The system displays the Cube Registry page. You can view this page in two modes (via the View buttons). Click the left View button for tree view or click the right View button for table view. White background  The group or cube is included, which means that the Cube Manager tasks update it. See the Exclude option in Specifying an Update Plan, later in this chapter. Gray background  The group or cube is excluded, which means that the Cube Manager tasks ignore it. In the right area, the Details tab (not shown) displays details for the current selection. You can make edits in this tab. The Tools tab provides links to other tools. When the Cube Manager is in tree view, you can expand or collapse the display of all registered groups, which are shown in the middle area. To do so, use the Expand All or Collapse All button, as applicable, at the top of the middle area. These buttons do not affect the left area of the page, which displays the unregistered groups. White background  The cube is included, which means that the Cube Manager tasks update it. See the Exclude option in Specifying an Update Plan, later in this chapter. Gray background  The cube is excluded, which means that the Cube Manager tasks ignore it. Pink background  The cube is not registered and therefore has no update plan. 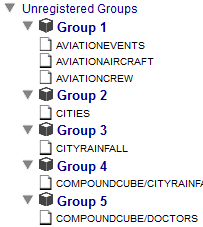 The Group Name field indicates the group to which each cube belongs, and the Group Build Order field indicates the order in which each cube is to be built or synchronized within its group. The Cube Manager computes this order only for cubes in registered groups. Display the Cube Manager in tree view. In the middle area, click the heading that starts Registered Groups. Edit the details on the right. For information on the options, see the previous section. Expand the list of unregistered cubes on the left. Drag the group from that area and drop it onto the Registered Groups heading in the middle area. Or display the Cube Manager in table view, click the row for any cube in the group, and click Register Group in the right area. In either case, the change is automatically saved. Click the group in the middle area. Name  Unique name of this group. Exclude  Controls whether the generated tasks perform update activities for cubes in this group. Initially this option is selected, and the group is excluded. The Cube Manager displays any excluded groups or cubes with a gray background. Update Plan  Select an update plan. Note that the Cube Manager does not permit you to use synchronization unless that cube supports it (as described earlier in this chapter). For example, you can choose the Build and Synch plan for the group, but the Cube Manager automatically sets the update plan to Build for any cube that does not support synchronization. Build every  Use these fields to specify the schedule for the build task (if applicable). Synch every  Use these fields to specify the schedule for the synchronization task (if applicable). Build Cubes Synchronously  Select this to cause DeepSee to build these cubes synchronously (if applicable). If this option is clear, DeepSee builds them asynchronously. Initially, these details apply to all cubes in the group. If you edit details for a specific cube and then later want to reapply the group defaults, click Apply to All Cubes in Group. Optionally click a cube within this group (in the middle area) and edit information for that cube in the Details pane on the right. In all cases, your code can perform any processing required. Modify each cube as needed. When you do so, the Cube Manager creates or updates the cube registry in this namespace. If the Task Manager does not yet include the necessary tasks, the Cube Manager creates them. You can merge one group (group A) into another (group B). Specifically this moves all the cubes from group A into the group B and then removes the now-empty group A. To merge one group into another, use the following procedure. In this procedure, group A must not yet be registered, and group B must be registered. Drag group A (the group that contains the cubes that you want to move) from the left area and drop it into the group heading of group B (the target group) in the middle area. The system prompts you to confirm the action. If group B currently has an update plan that cannot be used for some of the newly moved cubes, the system displays a dialog box to indicate this. Click OK. For any such cubes, the Cube Manager selects an update plan that can be used. Review the update plan for each newly moved cube and modify it as needed. Or use the following alternative procedure. In this procedure, both groups must already be registered. Display the Cube Manager in table view. In the middle area, click the row for any cube in group A (the group that contains the cubes that you want to move). On the right, click Merge to another group and then select group B (the target group) from the drop-down list. DeepSee provides a utility method that you can use to build all the registered cubes, in the correct order. The method is BuildAllRegisteredGroups() in the class %DeepSee.CubeManager.Utils. This method ignores the schedule specified in the registry but uses the build order specified in the registry. Before you synchronize cubes from the Cube Manager, it is necessary to build the cubes at least once from the Cube Manager user interface. The Cube Manager also provides options to build cubes on demand (that is, ignoring the schedule). In this kind of build, the Cube Manager rebuilds the requested cube as well as any cubes that depend on it. Save any changes to the cube registry. The build options are disabled if there are any unsaved changes. Display the Cube Manager in tree view and then click a cube in the middle area. Display the Cube Manager in table view and click a cube that shows Yes in the Registered column. On the right, clear the Exclude option. The Cube Manager then displays the build dialog box. The dialog box displays progress of the build. When the build is done, click OK. Display the Cube Manager in tree view. Click the header of the table in the middle area. Then click Build All Registered Groups. Continue as described previously. Display the Cube Manager in tree view. Click a cube group in the middle area. Then click Build This Group. Continue as described previously. In the middle area, click the X in the row for the cube group. register Immediately after registering a cube group. update Immediately after saving changes to a cube group. unregister Immediately after unregistering a cube group. build When building a cube. The Cube Manager generates an initial log just before starting the build, and then updates that entry after the build is complete. synch When synchronizing a cube. The Cube Manager generates an initial log just before starting the synchronization is started, and then updates that entry after the synchronization is complete. presynch Immediately after executing any code specified by the Pre-Synchronize Code option. postsynch Immediately after executing any code specified by the Post-Synchronize Code option. postbuild Immediately after executing any code specified by the Post-Build Code option. repair When you use the Build Dependency List option (which performs an on-demand build of a given cube and any related cubes). The Cube Manager generates an initial log just before starting the build, and then updates that entry after the build is complete. For information on other fields in this table, see the class reference for %DeepSee.CubeManager.CubeEvent. The registry’s Disable setting cannot be changed through the Details tab. For information on accessing this tab, see Modifying the Registry Details. The Build Dependency List is available for cubes, but the Build This Group button is disabled. Before you can synchronize a cube, follow the steps in Enabling Cube Synchronization, earlier in this chapter. For the specified cube (pCubeName), this method finds and applies all changes from the source data that have been made since the last call to this method. If pVerbose is true, the method writes status information to the console. For additional arguments for this method, see the class reference. Call the method from the part of your code that changes the data in the base class. This is the approach used in the Patients sample. Periodically call %SynchronizeCube() as a recurring task. If %SynchronizeCube() displays the message No changes detected, this can indicate that you had not previously rebuilt the cube. For historical reasons and for convenience, the phrase purging DSTIME refers to purging the older entries from the ^OBJ.DSTIME global. It is necessary to purge this global periodically because it can become quite large. Call the REST API /Data/GetDSTIME. See GET /Data/GetDSTIME in Tools for Creating DeepSee Web Clients. Pass, as an argument, the full name of the source class of the cube. This REST call returns the last ^OBJ.DSTIME timestamp processed for that source class on a given server. In the case of an async mirror setup, the timestamp retrieved from this REST service will be the most recent timestamp that can safely be purged on the primary production server. Using the returned timestamp as an argument, call the %PurgeUpdateBuffer() method of %DeepSee.Utils so that you purge ^OBJ.DSTIME up to but not including the timestamp processed on the remote server. The default behavior for this method is to increment the top node of the local ^OBJ.DSTIME so that every purge will provide a new sync point to be propagated to the DeepSee server. Determine the IDs of the affected records in the base class. Update the cube for those records by calling the %ProcessFact() and %DeleteFact() methods of %DeepSee.Utils. As input, these methods require the ID of the affected row or rows. Where pCubeName is the logical name of a cube, and pSourceID is the ID of a record in the base class used by that cube. For the given cube, this method updates the corresponding row of the fact table, the associated indices, and any level tables if affected. If pVerbose is true, the method writes status information to the console. Where pCubeName is the logical name of a cube, and pSourceID is the ID of a record in the base class used by that cube. For the given cube, this method deletes the corresponding row of the fact table and updates the indices correspondingly. Specify DSTIME as "MANUAL" rather than "AUTO". Then within your application, call the method %SetDSTimeIndex() of the class %DeepSee.Utils whenever you add, change, or delete objects of the class, or when you want to update the ^OBJ.DSTIME global. pClassName is the full package and class name of the object that you have added, changed, or deleted. pObjectId is the object ID for that object. pAction is 0 if you updated the object, 1 if you added it, or 2 if you deleted it or want to delete the corresponding fact from the fact table without deleting the object. The value of pAction is used as the value of the resulting ^OBJ.DSTIME node. Note that facts are removed from a cube during synchronization if the corresponding record does not exist in the source class, or if a value of 2 is specified for pAction. Then, when you want to update a given cube, call the %SynchronizeCube() method of the %DeepSee.Utils class, as described previously. In rare cases, you might need the fact table to include records that do not correspond to any source records. In such cases, use the %InjectFact() method of the cube class. pFactId is the ID of the fact. Set this to "" for an insert. On return, this argument contains the ID used for the fact. pValues is a multidimensional array of fact values. In this array, the subscript is the sourceProperty name (case-sensitive). pDimensionsOnly controls whether the method affects both the fact table and dimension tables or just the dimension tables. If this argument is true, the method affects only the dimension tables. You use this argument if you prebuild the dimension tables as described in the next section. By default, DeepSee populates the dimension tables at the same time that it builds the fact table. It is possible to prebuild one or more dimension tables so that they are populated before the fact table, if this is necessary for some reason. The %BuildCube() method calls this method just after it removes the old cube contents and before it starts processing the new contents. In this implementation, invoke the %InjectFact() method of the cube class and specify the pDimensionsOnly argument as true. For details on this method, see the previous section. Set tVar("Outlet.Country.Region.Name") = "N. America"
It is necessary to provide a unique ID as well as a name for a member. For completeness, this code should also provide the city population, longitude, and latitude, because the corresponding dimension table contains these values. It is also necessary to provide values for any higher level members. In some cases, there is no change to your base class, but there is a change to a lookup table that is used as a level. In these cases, you can update the cube in any of the ways described earlier in this chapter. If the only change is to a single dimension table, however, it is quicker to update the level table directly. You can do so via the %UpdateDimensionProperty() method of %DeepSee.Utils. pCubeName is the name of the cube. pSpec is the MDX member expression that refers to the level member to update. You must use the dimension, hierarchy, and level identifiers in this expression. For example: "[docd].[h1]. [doctor].&"
As a variation, pSpec can be a reference to a member property. For example: "[homed].[h1]. [city].&[Magnolia].Properties(""Principal Export"")"
DeepSee uses this argument and the pCubeName argument to determine the table and row to update. pValue is the new name for this member, if any. Or, if you specified a member property, pValue is used as the new value of the property. pKey is the new key for this member, if any. Specify this argument only if you specify a member for pSpec. By default, the key is also used as the name, so this action might also change the name. By default, the name is the key, so this action might change the key. Open the User Portal in the SAMPLES namespace. Click the dashboard Real Time Updates. Click the buttons in the upper left area. Each of these executes a KPI action that executes a method to randomly change data in this sample. The action launches the method via JOB, which starts a background process. This action calls a method that adds 100 patients and calls %SynchronizeCube() after adding each patient. Change Patient Groups changes the patient group assignment for some patients. This action calls a method that randomly changes the patient group assignment for some percentage of patients and calls %SynchronizeCube() after each change. Delete Some Patients deletes some patients. This action calls a method that deletes 1 percent of the patients and calls %SynchronizeCube() after each deletion. Change Favorite Colors changes the favorite color for some patients. This action calls a method that randomly changes the favorite color for some percentage of the patients. In this case, the changed data is stored in the DeepSee_Study.PatientDetails table, which is not the base table for the Patients cube. Hence it is necessary to use %ProcessFact() instead of %SynchronizeCube(). Set myquery="SELECT ID FROM DeepSee_Study.Patient WHERE PatientID=?" This block of code executes an SQL query to return all patients who are affected by the change to the data. It then iterates through those patients and updates the Patients cube for each of them. Add Encounters adds encounters for some patients. This action calls a method that includes logic similar to that for DeepSee.Study.PatientDetails; see the previous item. Change Doctor Groups changes the doctor group assignment for some of the primary care physicians. This action calls a method that includes logic similar to that for DeepSee.Study.PatientDetails. ^DeepSee.Study.Log(1)="13 May 2011 05:29:37PM Adding patients..."
^DeepSee.Study.Log(2)="13 May 2011 05:29:38PM Current patient count is 10200"